TRIVIA of Noh : Q71 : Is a drum always involved in the music? | Home | Trivia | Q71 : Is a drum always involved in the music? Is a drum always involved in the music? 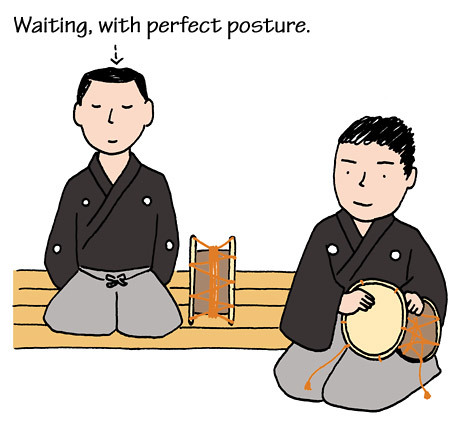 There are two types of Noh music, daishō-mono and taiko-mono. The former features a flute and two tabors, while the latter incorporates a drum into the music. Even in a taiko-mono, the drum is never played all the way through the entire piece. The role of the drum player is to accompany the dance and music at the climax to make the piece more spectacular. Like the main actor, Noh musicians are always seen on the stage. Even if they are not playing, they are not taking a break. From the opening of the play until it is his time to play, the drum player always pays attention to sitting beautifully. Unlike the tabor players, who sit on stools during the performance, the drum player sits on the floor, folding his legs under himself. Even when staring straight ahead and concentrating on the music without making a sound, he stills play his part in the performance.